Russian President Vladimir Putin and Sudanese President Omar al-Bashir, in Moscow, July 14, 2018 (Photo by Sergey Mamontov for Sputnik via AP Images). 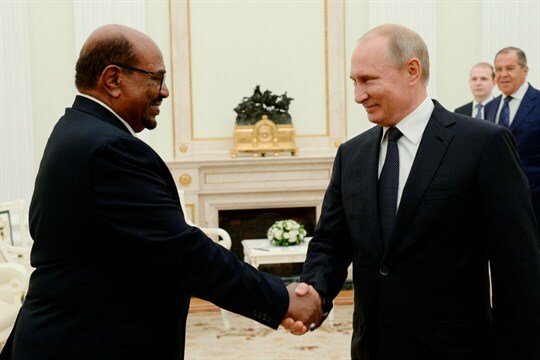 As protests in Sudan calling for the removal of President Omar al-Bashir enter their fourth month, Russian support for the regime has begun to attract international interest. Much has been written about Russian activity, whether overt or covert, in places like Syria, the Central African Republic and Venezuela. But until now, comparatively little attention has been given to Moscow’s involvement in Sudan, which is a linchpin of Russia’s approach to sub-Saharan Africa and, for this reason, will continue to enjoy Russian support despite its internal strife.